Dr. Dezham is inspired by the desire to help you achieve optimal health and provide you with the absolute best that dentistry has to offer. Find helpful information in our digital library. It's Spring Cleaning Time...for Your Teeth! There are a variety of methods for treating periodontal (gum) disease depending on its severity — from routine office cleanings to periodontal surgery. But the goal behind all of them remains the same: remove bacterial plaque and calculus (tartar), the root cause for gum disease, from all tooth and gum surfaces. The traditional method for doing this is called scaling in which we use special hand instruments (scalers) to mechanically remove plaque and calculus. Scaling and a similar procedure called root planing (the root surfaces are “planed” smooth of plaque to aid tissue reattachment) require quite a bit of skill and experience. They're also time-consuming: full treatment can take several sessions, depending on how extensive the infection has spread. In recent years, we've also seen a new method emerge for removing plaque: lasers. Commonly used in other aspects of healthcare, lasers utilize a focused beam of light to destroy and remove diseased or unhealthy tissue while, according to studies and firsthand accounts, minimizing healthy tissue destruction to a better degree than traditional techniques. Procedure and healing times are likewise reduced. Because of these beneficial characteristics, we are seeing their use in gum disease treatment, especially for removing diseased and inflamed tissues below the gum line and decreasing sub-gingival (“below the gums”) bacteria. Dentists who have used lasers in this way do report less tissue damage, bleeding and post-treatment discomfort than traditional treatments. But because research is just beginning, there's not enough evidence to say laser treatment is preferably better than conventional treatment for gum disease. 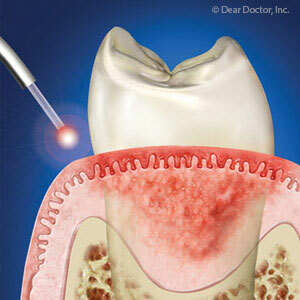 At this point, lasers can be an effective addition to conventional gum disease treatment for certain people, especially those in the early stages of the disease. As we continue to study this technology, though, the day may come when lasers are the preferred way to stop gum disease from ruining your dental health.